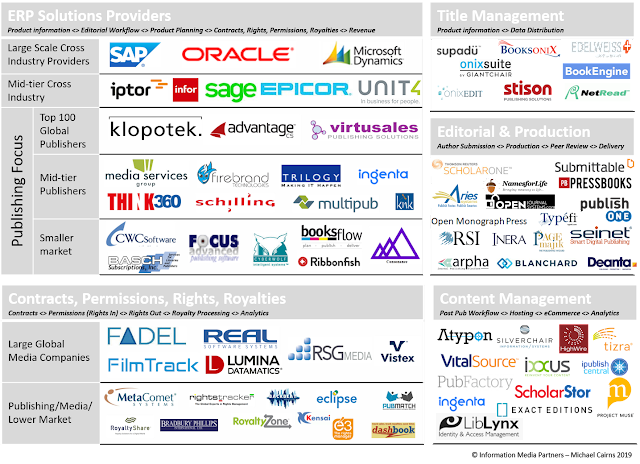 Our first market survey of the software market for publishing and information companies is complete and is available immediately. We are offering a pre-publication discount on the purchase of this report of $1,000 off the list price of $2,500 until January 31st. Included in the purchase of each research report is 30 minutes of consulting time you can use to ask specific questions about the report and the companies profiled. Additionally, you will also have an opportunity to help us tailor future survey work as we plan an industry-wide survey of IT budgeting and spending (which we will be working on during the first half of 2018). Purchase Now: Until January 15th this report is selling for $1,500 but will increase to $2,500 on publication. In this report, we have mapped the market for software products delivering solutions to publishing, information companies and other content-centric companies. Included are profiles of more than 30 companies providing ERP and CMS solutions. (In future reports, we plan to expand these profiles to the full range of companies identified on our market map). This report features information gathered from primary research interviews, secondary sources and ongoing market surveys and research. In addition to profiling the 30 selected companies, we also provide the trend information and intelligence senior-level managers should consider when making decisions about software acquisitions. For software vendors, this report provides market information and positioning information seen from the perspective of current and future customers. This information may (or may not) validate your marketing and sales strategies. The report is 30 pages in length. We are planning to undertake a full market survey to begin to define the components of IT spending for publishing and information companies. This, in turn, may form the basis for a benchmarking project whereby participating companies will be able to view the components of their spending against a cohort of like companies. We are in the initial stages for both of these activities and, if you are interested in participating in and/or sponsoring this work, please get in touch with us. Thanks for your attention and I look forward to consulting with you on this report.